The Story - Farmers Telephone Company, Inc.
Email Us to buy the book or CD. If you would like to visit, please stop by or call us to schedule a appointment. 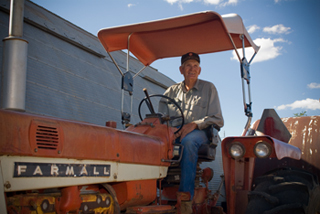 How a small, independent telephone company changed life in rural Montezuma County – forever. The year was 1920. Babe Ruth was traded by the Boston Red Sox to the New York Yankees for $125,000, the largest sum ever paid for a baseball player; F. Scott Fitzgerald published his first novel, This Side of Paradise; and on Jan. 16 of that year, Prohibition went into effect in the United States with the signing of the 18th Amendment to the Constitution. Prior to phone service, life was difficult for people in rural America, says Doug Pace, general manager of Farmers Telephone. “Until phone service was established in this region, most residents rode a horse, hitched a ride on a train or a buckboard, or walked many miles to carry news to family and friends. The advent of the phone changed everything,” says Pace. To honor the legacy of the people who founded the telephone company, Farmers Telephone is opening the “Farmers Telephone Museum” near its headquarters in Pleasant View. The museum contains artifacts, equipment and memorabilia that have been collected and donated by the staff, board of directors and local residents. It is housed in the original telephone company office, the building where Farmers first launched the company in 1920. The company also has produced a living history CD and companion book called, Talking News: The Story of Farmers Telephone Company. “The museum, as well as the book and CD, are an effort on behalf of the telephone company to educate the public about life in rural Colorado nearly a century ago,” says Pace. “It’s also our way to pay tribute to the farmers and their families who had the vision to bring telecommunication services to this area.” Today, Farmers Telephone Company provides phone, high-speed Internet and Web-based services to communities throughout the Four Corners. White, Hollen, and other local residents are featured in the hour-long audio CD as well as the book on the telephone company. The opening of the museum was celebrated with an ice cream social on Oct. 4, 2008, at the site of the new Farmers Telephone museum. For more information, call 970-562-4211.